When it comes to L.A.'s coolest hair color techniques, Cherin Choi is the one to watch. And it makes sense: She started at Ramirez Tran salon (which is the incubator for top L.A. hair pros), and currently resides in the seat next to Sal Salcedo at the first high-end salon in the downtown Arts District. Her coolest look of late? Geode hair. Luckily, it only looks complicated. Choi started by lightening her clients hair from the bottom up, without bleaching the roots. "The lightened hair is lifted to a pale yellow, then is toned to a blondish white using Redken Shades 9v/clear to eliminate yellow," she told us last night. "The hair is completely dried, then the amethyst purple is applied on the mid sections, then the moonstone blue onto the very tips." Here comes the trick: "I use a brush and emulsify with my hands to blend the colors." This makes the grow-out process completely painless. 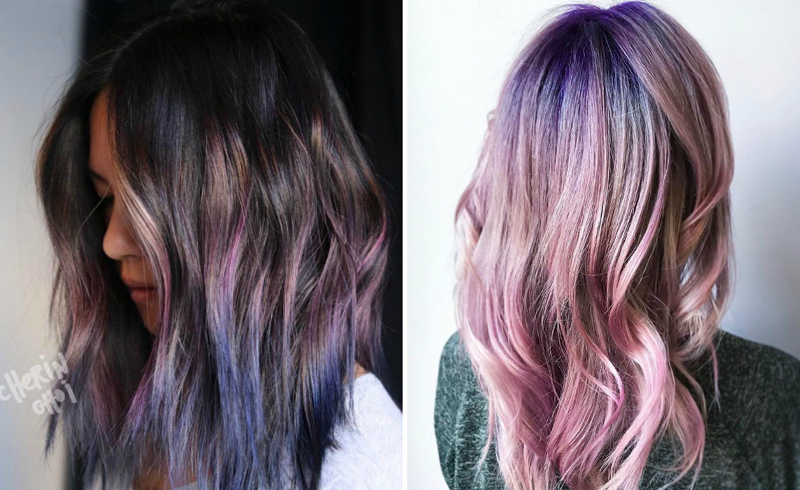 Now, different versions of iridescent hair color have popped up over the past few years, but what's amazing about this trend is the restraint being used. This isn't rainbow hair, this is geode hair. That is, vibrant, jewel-toned sombré in one or two hues. And you don't have to bleach your hair to oblivion to get it. Click ahead to see how top colorists are interpreting the trend right now. Daniel Moon is a rainbow-hair genius. Notice how the two shades he picked are so close in tone, they almost look like one. But look closely and you can actually see that it's actually lavender (at the top) that blends into amethyst (at the ends). Choi shared her secret formula with us: "I made the amethyst tone with Pravana and the bottom is Moonstone by Joico!" she says. 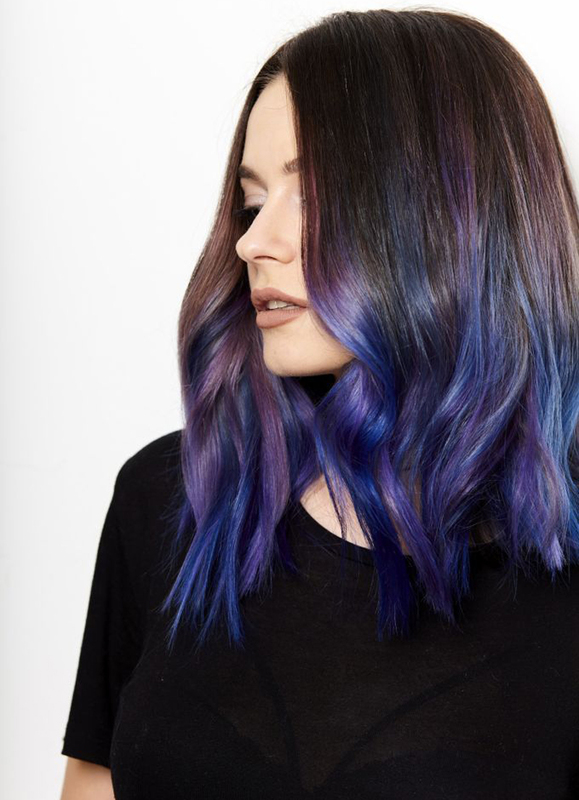 L.A. colorist Guy Tang may not have openings until, well, ever, but you can still cop his take on the look by bringing this photo to your own colorist : He used his new line to craft a similar look, but done in a brighter blue. This gorgeous take from Swedish salon Hairdresser On Fire takes on the trend with two shades of purple — and we can't take our eyes off it. Rainbow colorist Kristi Waldrop also used Tang's new line to craft this unapologetically bold interpretation. We love it because it centers the brighter hue at the middle for major shine. Prefer more purple, and less blue? L.A. colorist Natalie Zetino lets the amethyst take center stage with just a whisper of aqua. Colorist Cash Zagaro goes for the softest take we've seen — and somehow the most memorable. Just a touch of rich, jewel-tone amethyst make this look by colorist Christina O'Brien a win-win for dark hair with old highlights. Want to ease in? Colorist Marissa Kay plays with a golden sombré and just tips the ends in light purple for a more wearable option.